To explore Canada from one coast all the way to the other one is of my great wishes. Three years of living on the Saskatchewan prairie have only strengthened that thirst to roam across this vast, diverse nation. After such a journey, I might even be able to correctly label all ten provinces on a map. My first Canadian encounters were visiting my grandparents in Ontario when I was a child. Later on, my parents brought my sister and I on a long but worthwhile road trip to British Columbia. The majestic mountains of the Canadian Rockies and the charm of the gardens and architecture in Victoria remain etched in my memory. I hope to return some day with my husband and children. 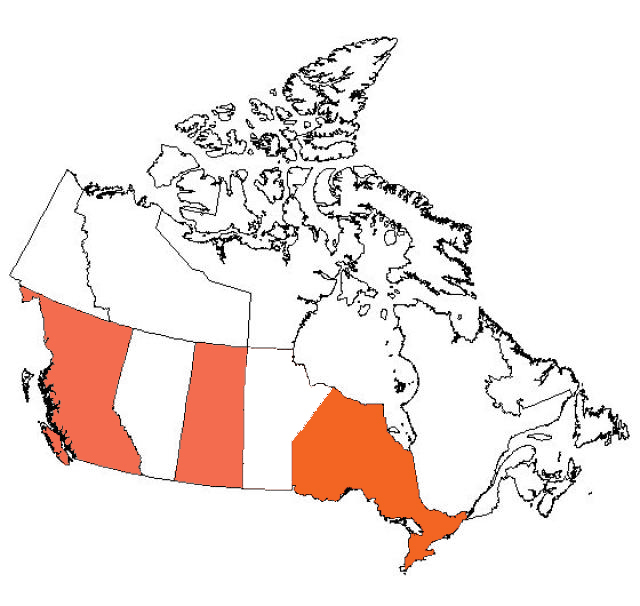 Besides Ontario and B.C., there are many other provinces I have never visited and know little about. Not having grown up in Canada, I am a bit puzzled by how the provinces and territories are counted. But I am still enjoying learning more about this country that my Swedish immigrant forebears came to call home. Especially since I am leaving Saskatchewan in a couple of short weeks, I find myself wishing I could take a grand farewell tour. However, it will have to be a virtual tour at this point. Regrettably, my family and I will be too busy making our international move this summer to hit any more of our Canadian wish list destinations. 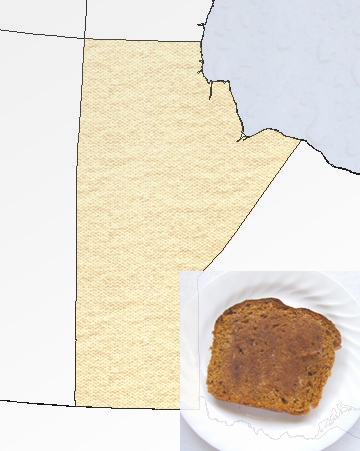 In the meantime, I have come up with a culinary depiction of each province, with puns intended. Inspiration for this series came from an offbeat project by Chris Durso to represent the 50 states with food. Small-town Saskatchewanian culture been immortalized in a popular comedy series, which we were instructed to watch when we arrived. That was very good advice. Almost everything I needed to know and appreciate about Saskatchewan, I learned from Corner Gas. We enjoyed the recent feature-length movie too. In addition to Ukrainian and Scandanavian immigrants, there is also a legacy of Chinese immigrants here, dating back to the building of the railroads. Before we leave Saskatchewan, I would like to tour the tunnels of Moose Jaw and learn more about the history of Chinese workers here. For better Chinese food, however, we’ve learned that one usually has to dine in Regina or Saskatoon. During our time in this province, we have gathered that desserts and sweets are the real pride and joy of prairie home cooks. For example, we were treated to some amazing freshly made potato donuts (pictured above) one night at a weekend family camp in Strasbourg, Saskatchewan. 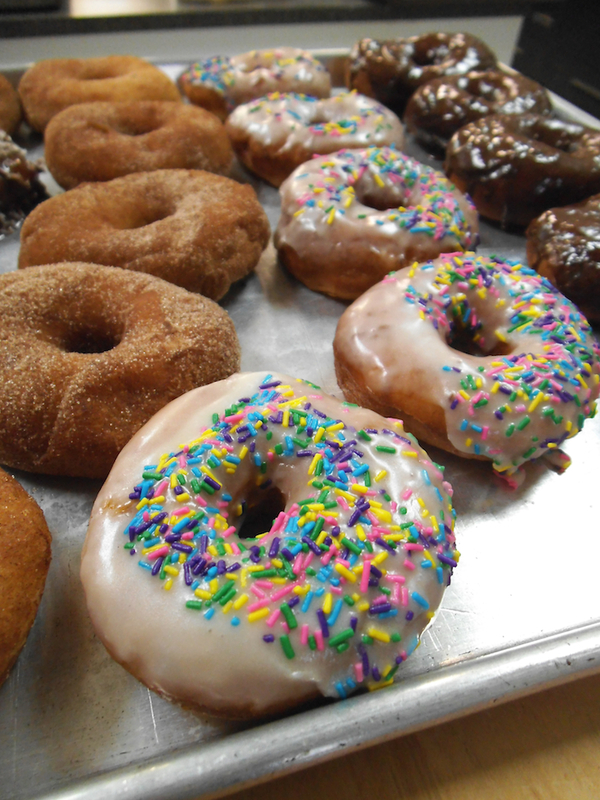 And here’s a potato donut recipe to try at home: a Spudnuts recipe from Home for Dinner. Mountain grandeur taunts us next door, just a day’s drive away. And all the Mexican restaurants in Calgary. Plus the Albertans have a dinosaur museum. Saskatoon berries can be found in all of the western provinces, which is yet another reason to explore the hiking trails of Alberta and beyond. 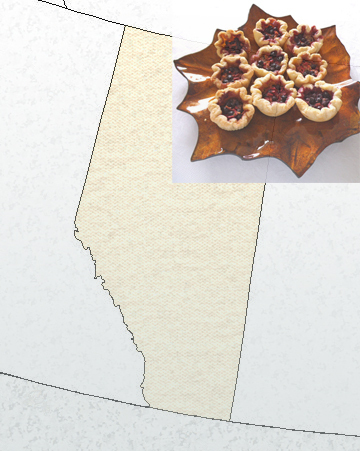 In the inset of the map above are my Canadian Butter Tarts with Saskatoon Berries and Rhubarb. 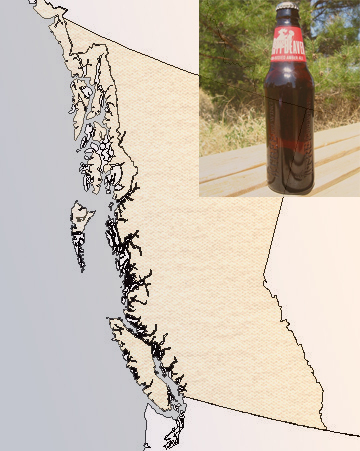 I married a craft beer snob, and one of his favourite Canadian ales was introduced to us by generous folks who hail from B.C., where great varieties of hops grow. We need to go there as a family, perhaps when camping is not such a daunting prospect. Trees and mountains attract us, as does the ocean. I am afraid though, that once I eat at an Asian restaurant in Vancouver, I would never want to leave. 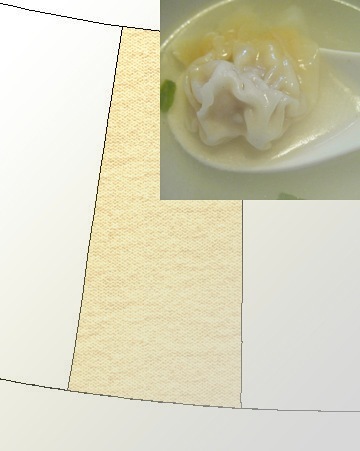 The dim sum, I have heard, is amazing. This province made me feel better about living in Saskatchewan. Because it’s often just a little bit colder there. But our neighbouring province does boast waterfront galore. I see on the map that in addition to the shores of Hudson Bay, there are some mighty big inland lakes in Manitoba. And most everyone likes toast, from the rugged outdoor enthusiasts to the Winnipeg city dwellers, right? Have you ever been to western Canada? Which province(s) would you like to visit? I’m joining Fiesta Friday this week. Hello Julia! I’ve been thinking of you all as you wrap things up in SK…so much to do and squeeze in! I really enjoyed this post. 🙂 Do you also remember visiting us in S. Ontario? We had school til the end of June and I thought it was so amazing that you and Priscilla finished in May! We did go fishing in our little ponds with you, and the rest is a blur! Anyway, those butter tarts sound incredible! Looking forward to part 2 and blessings to each of you! You’ve seen more of the west than I have! Impressive! I love this post with your punny titles. Everything I know about SK, I learned from Corner Gas too. Thanks for including my recipe for Wild Chokecherry Jam. Looking forward to part 2. I like the punny food association into different provinces. Beautiful! I have lived in BC, travelled to Alberta and now live in Ontario. I have much to see in this province but your post had evoked the interest to visit the other provinces. I’m glad to hear it! So many interesting places to discover here! I this post and your provincial titles! Can not wait for part 2 🙂 Fantastic idea just in time for Canada Day! Thanks! I plan to post the conclusion on Canada Day, in fact! Love this post! Looking forward to reading other parts! Thank you! Thanks, Julia! Come back for more on Monday! What cute puns, looking forward to seeing the others! I’m only up to 4 provinces, but hopefully will see others in due course, now I’n to as far. Thanks for sharing with Fiesta Friday. Thanks! Four provinces is better than none. I’ve only visited three. 🙂 Have a lovely weekend! Absolutely! Poutine is quite similar to American Chili Cheese Fries, minus the spicy meat of course. I’d love to have it in Quebec though!